I can see why this book excites such strong reactions in people, although I think I might have gotten more out of it if I had finished it when I first started it more than half a lifetime ago. The voice of this one is very interesting – although, we are much more familiar with it today than people probably were when this book first appeared. This is Woody Allen as a boy. I guess I have to use the phrase, ‘teenage angst’ at least once. It is hard to know what to make of this book – it is hard to know if one is to identify with the main character or not – and after hearing his story told in first person and having lived through lots of emotionally charged experiences with him, it is hard to stand too aloof. All the same, this isn’t someone I could entirely identify with, but then, I don’t think this is a book that was written to get someone my age to identify with the main character. This is a teenage angst book written to be appreciated most by those going through teenage angst. I don’t want this review to sound too negative – I actually enjoyed the book quite a lot – however, many of the themes have become so standard and have been repeated almost as much as that Dirty Harry moment when the good guy has to run from phone box to phone box before dropping off the money. If you haven’t read this one, you actually know the story very well, you just don’t know it yet. Which I also found interesting – as I wasn’t totally sure what this book would be about before I started reading it. I did make a half-hearted start to it a life time ago in High School, but stopped very early on and never quite got back to it. I think I would have enjoyed this book more then than I did now. The character I found most interesting was good old Phoebe. It is interesting that he nearly constantly refers to her as old Phoebe when really she is much younger than him. She is his baby sister. But if this book is anything it is a hall of mirrors. One of the main distortions in the reality of what we might expect in this book was Phoebe. Holden’s first conversation with her is a real ‘out of the mouths of babes’ moment. We have just learnt that she has an extensive part in the school play and she (in a signalling piece of irony) is playing Benedict Arnold. Virtually her first act in the story is to selflessly protect her bother and put herself in danger of being punished for his sake. Also interesting is the fact that she tells Holden that he is constantly negative and completely without direction. It might be that she is just repeating what her parents have told her, all the same she comes across as one of ‘those’ children that one finds so often in novels; children who are far too old for their years. Holden’s dream of becoming the catcher in the rye, someone who essentially saves young children from accidental death caused by thoughtlessness, is also part of the mirror like distortions. Here is a young man on the cliff edge and his dream job is to catch and protect other young people in danger. This book was probably saved by being written in first person and by being seminal to the whole genre of stories about teenagers who don’t quite fit in, you know, all the way up to Donnie Darko. I think I enjoyed this book more than this review is really showing, but I think the book has probably dated and so it is much less shocking than I guess it would have been in 1950. Fortunately, Holden gets to be ‘treated’ at the end of this book and so everything is going to be just dandy – although, the kind of ennui he is suffering from is probably best cured by years than medication. This is the sort of teenage novel we are all too familiar with – a young man on the brink of adulthood suddenly released from the constraints of adult rules and thereby being able to ‘play’ at being an adult. Normally, in these teenage stories (even in the best of them, like The Graduate) we get to laugh – in this one reality is never far enough away for us to get a good belly laugh. 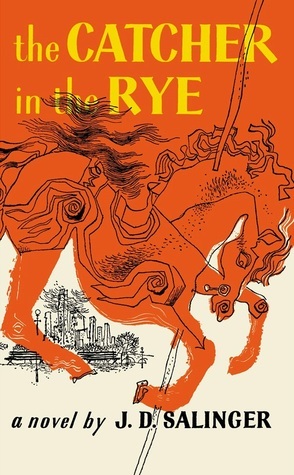 This is not ‘the great teenage adventure’ – this is a book about dancing on the edge of the cliff and despite how much we might wish, there simply is no catcher in the rye waiting to save us. I read it in college and again in my forties and liked it very much both times. Now I'm trying to recall it in detail - I can't - and figure out why it was so attractive. In my case, I think I was intrigued by Holden, actually rather envious of his struggles and "dysfunctional" (an overused and essentially wretched word) attempted solutions. Basically, I believe I saw his adolescence as more of an adventure than mine, however negative his seemed to be, whereas my own was by contrast relatively easy and conventional; he became a kind of safe but intriguing alter ego. And reading him in my forties allowed me to reflect on that. I think I enjoyed it more than the review makes out. I can understand why people would get annoyed with his whine - but there is a point to it. I know what you mean about the alter ego, I also had a rather conventional adolescence, which was as dull as dishwater compared to Holden's. I know people who find it enormously funny -- and I think that's a good reaction. I don't mean that the central message is funny, but the style, with the self-deprecating, self-cancelling cynicism of the young. But others do find him whiney and annoying, and I think his expression has aged a bit and sounds more whiney now than it would have at one time. I love the image of the catcher. I think it's a beautiful thing, not least because it is so odd. But I've always assumed that Holden's desire to save children from falling off the edge (which is also, I think, from growing up and realising how empty the values of the world really are) is connected with the death of his little brother -- Allie, is it? The one whose baseball glove he carries round with him. I have always assumed the death of the kid is what has caused Holden to fragment. Why it doesn't seem to affect old Phoebe in the same way, I don't know. But I find the end very interesting because I don't think everything is necessarily going to be fine and dandy at all. It is a structural device, of course, to explain why Holden is telling someone all this stuff, why he is explaining the last couple of weeks since he ran away from school, but I can't see that it suggests anything positive at all. He seems to be in a psychiatric hospital. The whole story doesn't seem to add up to any kind of solution that I can see. I've always thought it's left completely open whether Holden is 'okay' at the end or very far from it. If his view of the world is 'true' we are all sunk. That was the bit that I found most interesting about this - that he doesn't end up 'cured'. American fiction does tend to strongly believe in psychiatric cures - I always think of that last episode of MASH and the murdered chicken/child. Or Good Will Hunting. I think you are supposed to exhale a sigh of relief that he is in such a hospital at the end - but, like you, I really didn't feel it was very likely that it would 'solve' anything. And there is that guy he catches up with for cocktails who recommends Holden visits his shrink father for a full personality assessment. I have trouble with knowing if that stuff is meant to be ironic because I have such a strong reaction against it that irony is always my first guess. I didn't think you were meant to sigh with relief that he was safe at the end. I thought you were supposed to assume, right through the novel, that the narrator was in a position of having 'come through' and somehow gained the wisdom of experience -- all the events narrated safely in retrospect, and that it should come as a slightly disquieting shock at the end that he wasn't 'home' in any sense. But even that's not presented as a shock; just as an understated fact. The shrink father is the reader effectively. Which really puts the whole problem onto you. Got any answers, reader? Salinger tells you this is not a David Copperfield story. So don't read it like it is about Holden. Hint: look at the first page of David Copperfield to understand "Caiulfields" name. Read my review of the book. Cosmic, you have a view of this book and a way of reading it. Fair enough. But not all other ways are 'taught' ways of reading. The book may be about money, power and war. It's also about love and adolescence, and that's the top story that most readers will pick up on. And it's funny and sad. Your link to the Merry Go Round music doesn't work. I'm not convinced this novel is an allegory, but if it is, and it's taken all this time for you to work it out, it wasn't a very effective way of talking about the war. A caul, and to be born in one, is a sign of luck. So for David Copperfield, it was a good augury. Holden Caulfield doesn't have much luck. Not any, really. Except perhaps in having a little sister as well as a little brother. I often think of the evidence from the Beatles albums that Paul is dead, which I've always found much more convincing than I suspect Paul ever did. You are much nicer than I am, Nell. I read Cosmic's review and couldn't think of a thing to say. The evidence of my niceness should not be trusted. I think this review is very much on point. Thank you for sharing it! Confession: every time I finish a book and jump onto Goodreads to leave my review, I’m always thrilled if I see Trevor has left a rating, and especially a review. Trevor, I honestly get so much more from my reading experience by hearing your thoughts. I just finished Catcher last night, and am struggling to put my reaction into words. I think I may have loved it? And I’m a 38-year-old man, so I’m not really the teenage-angst type. This may be an obvious comparison, but I was reminded of Alice Munro’s short stories --- a calm and everyday human tragedy packaged in very modest, matter-of-fact writing. I was unexpectedly unnerved by Holden and old Phoebe. Anyway, I might stew on this for a few more days before starting my review. Oh --- one other thing! I’m not buying the WW2 allegory. God, I read this seven years ago! It seems impossible. I guess it is nearly time to read this again. Thanks Matthew, that was a very kind and generous thing to say - I will try to remember to check for your review over the next couple of weeks, as I would be interested to see what you say about the book. It is a classic of 20th C lit - so, loving it should involve no shame at all. My first literature teacher told me that he read it once a year - can't imagine doing that myself. Although, I really should re-read more than I do, it is just there always seems so much else to read that it seems terribly indulgent to re-read. That is a very interesting discussion. Time for me to tread The Catcher in the Rye. Reread not tread. Goodreads makes it difficult to edit errors. OK --- so I did get around to writing a review this weekend: https://www.goodreads.com/review/show.... RE: re-reading (surely an all-time record for most consecutive "re's"?) --- I'm the same. I can't bring myself to read even my most favorites twice. I agree it seems incredibly indulgent. But I'm the same with film and television too. I cannot stand watching the same film twice, even if I desperately want to. It's an affliction. I think part of me wants Holden to be the catcher - his own catcher, the protector of his own childhood innocence. I guess the standard reading would be that his mishearing of the song leads to his projection of himself as the catcher and saver of children and this is essentially a call for help underlining that he needs to be saved. But then, don't we all? The extent to which other people can do that saving is an open question, and appears to remain so in the book too. So, I guess my preferred reading (and I haven't read this for ages, so - you know - grain-of-salt time) is the catcher and the caught are both aspects of himself. It is hardly surprising he identifies with the catcher - we do, don't we? But few readers would identify him with the catcher, I think, even though he explicitly does so himself. The misheard lyric is really interesting. Pinker says that the thing about misheard lyrics is that they generally don't make any sense. But that hasn't been my experience, we make them make sense. Here the misheard lyric opens up a whole world of interpretation to worry over. My favourite example of my own is my mishearing a line from Patrick Pearse's The Rebel - "I'd have worn stripes on my body rather than to suffer this shame on my people" which I heard as "I'd have drawn bone from my body..." You know, wearing stripes is one thing, but you'd have to say ripping a bone out of yourself is quite another. I just came across this review and I am so glad I did so! It was written so professionally, but at the same time reflects your thoughts as authentically as possible. I agree completely with the idea that one could have gotten much more out of it as a teenager with a more cynical outlook on life. I think that one's attitude toward life is also key to developing an opinion about this work, for I had a greater attitude and would not be able to relate to Holden Caulfield in this matter, not to mention that his adventures were meaningless in my mind. I do like his sister, Phoebe, for she brings out his more sensitive, understanding side. The only other one that could do this was his deceased brother. I gave this book three stars as well, only my three stars are less enthusiastic. Phoebe was my favorite, too. Seeing her through his eyes was quite beautiful. That late scene with her on the carousel did me in. I find Holden not just suffering from teenage angst but mourning the loss of his brother. If any one has ever lost someone close to them in their life they can see the patterns in Holdens behavior (disinterest in school, pushing away any friends or potential friends, not having any immediate goals to keep him focused). He’s lost and looking for an anchor but each anchor disappoints him such as Antolini or his teacher from Pencey. They disappoint because they can’t see Holdens true pain and cannot diagnose it with kindness and attention either because during that time therapy wasn’t a thing or simply they’re too disconnected to see it. Either way, in the end when Phoebe comes after him and wants to run away with him proves that his anchor has been there the entire time in a body other than an adult. He needed someone to show that they’d be there for him no matter what and no one could provide that other than Phoebe because she needs him too. There is a bit of optimism in the end that he won’t jump out a window like Castle and yet he hasn’t lost his authenticity or voice through his therapy. This is a lovely reading, EJ. Thanks for posting. I read it ages ago and I remember not liking the book. Other than that I don't remember anything . Over the years every time I come across it I feel like I should read it again. I don't think I will like it any better, but it bothers me how I remember absolutely nothing from the book. its like you read my mind. Also I cant decide if I should re-read some of the books that are my favourites. But then I re-read Life of Pi a while ago and disliked it . Infact I couldn't bring myself to finish it this time. Though when I first read it I couldn't stop talking about it. Oh no - ramble on as much as you like. I've had exactly the same experience. The worst part is when you recommend a book you read and loved years ago and the person looks at you as if you are insane the next time you see them. It is probably safest to only recommend books you've only just finished...I suspect we rewrite the books we have loved from the past in our memories.